Sepang day 3, final round up: Pedrosa fastest, Espargaró pesters Ducati, Rossi in 3rd. The final day of Sepang showed a similar story to the other days, in that first as usual was Dani Pedrosa, setting a fastest time of 2.00.100, a further -0.449 of a second faster than his time on day 2. 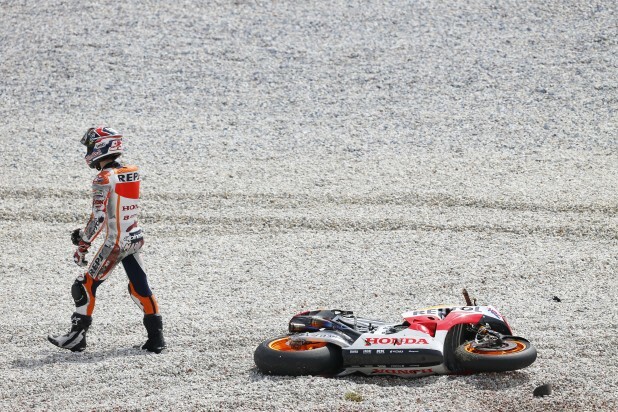 With this, Pedrosa also beat Lorenzo’s best lap time from the 2012 Sepang test. Despite being fastest and having the potential to go quicker, increasing his lead, Pedrosa went in early before the final whistle, having finished his testing program. The morning sun shone over the Sepang circuit, providing good conditions for fast laps to be set. However around 1130am, Marquez bit the dust losing the front into the last corner; he walked away unharmed, probably without even bruising his ego. Prior to his off track excursion, he was consistently lapping under 2:01. Marquez improved on yesterday’s time by 0.267 of a second, ending up 4th overall. Reigning world champion Jorge Lorenzo fell a bit further behind Pedrosa again today, the gap between the 2 before rain stopped play was over quarter of a second, compared with the +0.019 of yesterday. Though fast as always, he didn’t quite beat his time from the 2012 test. Although the aim of Lorenzo’s game this afternoon was consistency over raw speed, as he was doing a race simulation this afternoon, before the rain started to fall. Meanwhile his team mate Valentino Rossi continued his progress on the M1, finally breaking the 2:00 barrier with a best time of 2.00.542, which is -0.496 better than he managed on day 2. This lifted VR past Marquez overall into 3rd. Expect even more joyous comments from the now veteran Italian, later today. Meanwhile Yamaha team mates Bradley Smith and Cal Crutchlow continued to impress and show good form on the final day, both ending the test in 5th (Cru) and 8th (Smi). Crutchlow has been running the 2012 M1 Yamaha, and finished just over half a second behind Pedrosa, and less than a hundredth behind Marquez. Whilst GP rookie Smith once again silencing any doubters, improving yet again with times under 2 seconds off the pace, beating all 4 Ducati’s. He ended day 3 just four hundredths behind Go&Fun Gresini Honda rider, Alvaró Bautista. Factory supported LCR Honda rider, Stefan Bradl finished the test behind Crutchlow in 6th, this being the German’s second year in the top class. He was a mere quarter of a second off Crutchlows time with a 2.01.003, narrowly falling short of the 2.00 barrier. This time placed him half a second ahead of fellow Honda rider Bautista. It was evidently another struggle day for Ducati with Nicky Hayden finishing as top Duc in 9th, over 2 seconds behind Pedrosa. 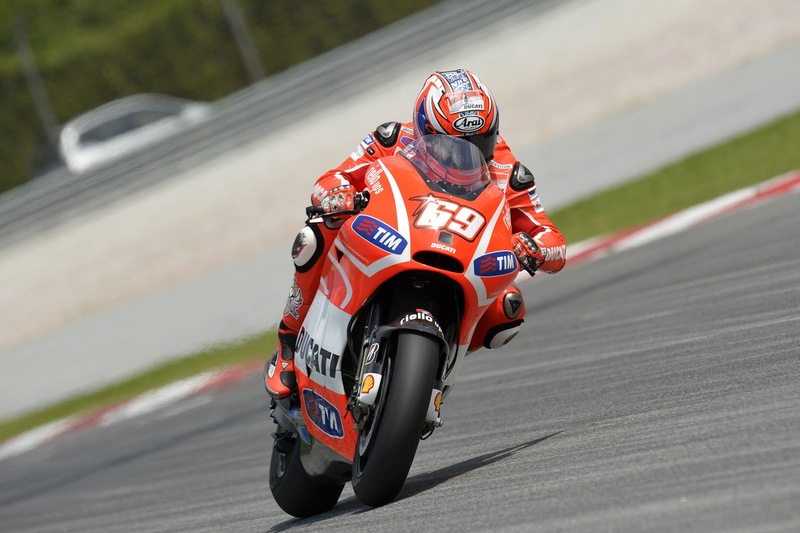 New team mate, Dovizioso was a further 0.093 behind Hayden. Pramac rider Ben Spies chose to sit out of today’s test nursing the shoulder injury he aggravated in the the previous days, whilst GP rookie Andrea Iannone struggled to adapt to the difficult Desmosedici posting a time ~2.7 secs off the lead. Clearly there are still issues with the Bologna based factory bikes. As for the CRT’s and Aleix Espargaro continued to impress with a time just 2.5sec of Pedrosa, placing him ahead of Ducati rider, Iannone. The next CRT was down in 15th in the form of PBM rider Michael Laverty, another rider silencing any doubters. He was riding on an ART during this particular test, as the PBM framed/Aprilia engined bike he will race this season, won’t be ready for a few weeks yet, a top performance by the Northern Irishman. RdP on the second Aspar ART was close behind MLav in 16th under 4secs off the pace. Behind RdP in the CRT ‘class’, Hector Barbera finished over 4sec off the pace whilst struggling with chatter problems, he was followed by other CRT’s, Petrucci on the Suter-BMW, Karel Abraham debuting his ART Aprilia and Hiroshi Aoyama, nursing that left wrist from a training incident. These riders were all inside the 5 second bracket. Outside the bracket, next was Forward racings Claudio Corti, followed by rookie Lukas Pesek, Columbian Yonny Hernandez with Colin Edwards and Bryan Staring struggling to adjust to their new machines, bringing up the rear. Statements from riders will follow later today. Previous Previous post: Marquez leaves MotoGP paddock with a sense of deja vu. Next Next post: Alstare reveal WSB Panigale for 2013.